in 1990. 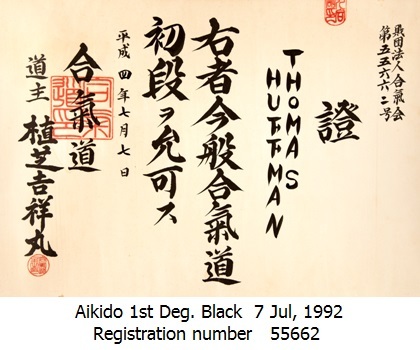 He became a student of Hitohiro Saito (6th degree) of Iwama Style Aikido one night per week and trained with Nishio Sensei (8th degree) or his senior students of Nishio Style, in various dojos, all the other days of the week. During the early years in Japan, Tom would travel up to the town of Iwama, north of Tokyo, to study with Morihiro Saito (9th degree) on many weekends. Hitohiro Saito's class also had numerous weekend seminars held in Iwama. Nishio Sensei would also have one or two seminars each month in various locations around the Tokyo area and south of it. In November of the first year at Atsugi Naval Air Facility (1990), Tom was sent to Okinawa for a military library oganization school. 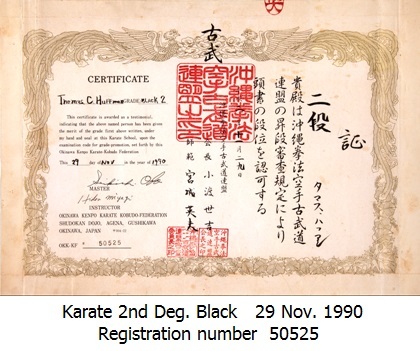 While on Okinawa for this period Tom met and trained with Sensei Seikichi Odo in Agena, Okinawa and was promoted to 2nd degree black belt by recommendation in Okinawan Kenpo Karate Kobudo. During all the time in Japan, Tom would arrive early for Nishio Sensei's classes and receive one on one instruction in Iaido. Iaido is the art of drawing the sword such that as soon as the sword leaves the scabbard it is on the path of a lethal cut. 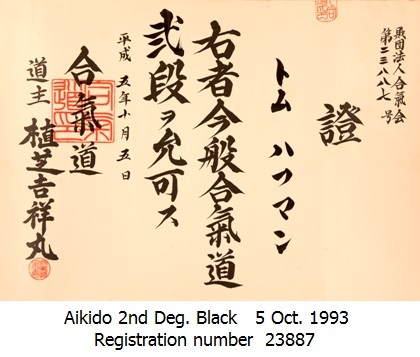 All this practice led to rapid advancement; 1st degree black belt in Aikido in July 1992, 1st degree black belt in Iaido in March 1993, 2nd degree black belt in Aikido in October 1994, 2nd degree black belt in Iaido in July 1995, 3rd degree black belt in Aikido July 1996. 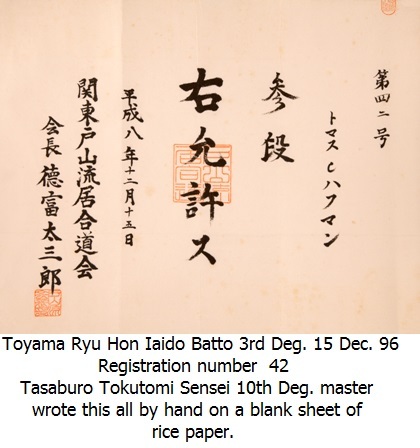 In the fall of 1993 Tom was introduced to and accepted as student of Battoh Master Tasaburo Tokutomi (10th degree Toyama-ryu Hon-Iaido) and began practicing Battoh on Saturday afternoons and evenings. Battoh is the art of cutting rolled rice matting using a "live" (sharp edged) samurai sword. This is a school organized for the Japanese Army after World War I in the early 1920's, and became the style of Iaido taught to the Japanese Army. Testing and promotion in this style of Iaido is rare at this school. 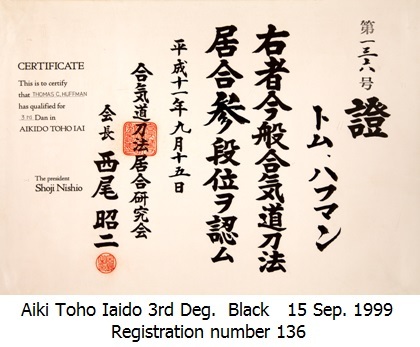 In December of 1996 after a successful cutting test in front of Iaido masters from the Zushi and Kamakura areas Tom was promoted directly to 3rd degree black belt in Toyama-ryu Hon-Iaido. In March of 1994 Tom was reassigned to the aircraft carrier USS Independence which was home ported in Yokosuka, Japan about 40 miles SE of Tokyo. When the Independence was in port, Tom continued in the Iwama Style with Ryuji Sawa Sensei. (formerly Inagaki Sensei, 6th degree)(He was adopted by his wife's father.) Sawa Sensei grew up in Iwama and was promoted by O'Sensei to 2nd degree black belt when he was only 13. For those who know the older Traditional Aikido volumes published by Saito Sensei in 1972, Sawa Sensei's older brother, Shigemi Inagaki, is in practically all the kumijo pictures with Saito Sensei. Sawa Sensei teaches in the fishing town of Misaki Guchi at the end of the Miura Peninsula about one hour by train and bus from the Yokosuka Naval Base. 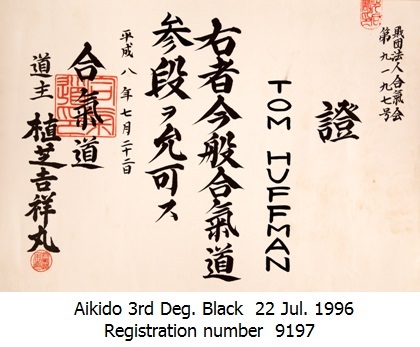 In December of 1996 Tom became one of the few foreigners to be presented the "All Japan Good Deeds Award" by the Japanese Prime Minister's office. Known as the Zenkokai Award, there had only been 780 foreign recipients of this award since 1955 (Foreign isn't just the U.S., it means the rest of the world.). This was given for Tom's efforts to promote Japanese arts to Americans and for being an example to Japanese students around the Tokyo-Yokohama area. It is very easy to poo-poo this. This is equivalent to receiving an award from a top leader of your country. In the U.S., this is equivalent to receiving an award from the President or Secretary of State. 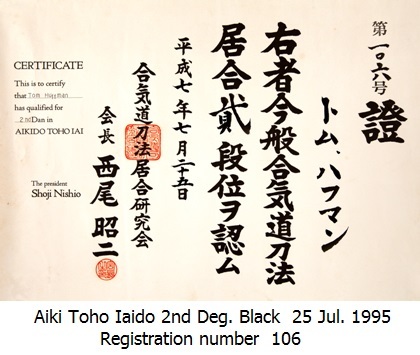 Since leaving Japan in February of 1997 Tom has been further promoted to 3rd degree black belt in Aiki Toho Iaido by recommendation from Nishio Sensei and to 4th degree black belt in Aikido also by recommendation from Nishio Sensei in August of 2000. Soon after retiring from the Navy and starting college here in Gainesville, Tom became one of the instructors for the UF Aikido Club. He formerly taught both empty hand and weapons in the UF Aikido Club from summer of 1997 to summer of 2004. When it became clear that teaching effective technique was not the goal of that club, there was no point in continuing to teach there. In 1998, with support from Dr. Tyree (former president of Santa Fe Community College), Tom started the SFCC Aikido Club and continues to teach that club, year round, on Mondays, Wednesdays and Fridays. In January 2002 Tom opened his first commercial class, Aikido of Gainesville, at the Unified Training Center at 809 W.University Ave. In May of 2013 it became necessary to expand Aikido of Gainesville's horizons. We moved to a warehouse in the Southwest Industrial Park with higher ceilings and quieter atmosphere. This allowed expansion of the scope of techniques. 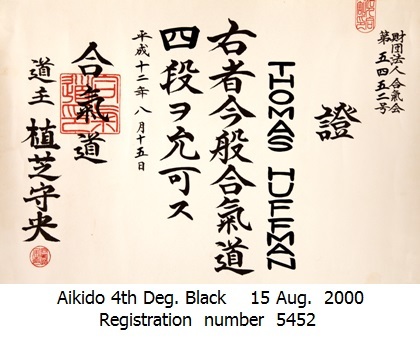 When Tom is not teaching Aikido his time is devoted to learning how to put Aikido video on the internet to spread high quality Aikido around the world by teaching analysis of Nishio Sensei's style. The third person style of writing here was preferable to a lot of I, I, I's or he, he, he's. If you feel a few ha, ha, ha's over this, that's OK.
Yasuhiko Takemori Sensei 6th Dan- now 7th Dan Nishio Style Aikido and Aikitoho Iaido One of the senior sempai students of Nishio Sensei. 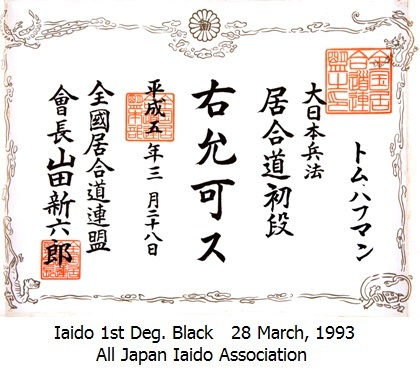 Takemori Sensei is also at least 7th Dan in the All Japan Iaido Association. How many people ever meet a 10th dan, let alone train directly with three 10th Dans?